When I woke up from bed on Thursday morning, a vision of a vortex, or it could have been a tornado appeared in my mind's eye. The night before I had made a call to HT. It was distressing to see him in a deeper depth of depression, and had been resorting to alcohol both morning, and in the evening to deal with the emotions he was going through. After putting the phone down, I was in tears as I cried to the Lord about this. Putting on some music, I started to calm down and then headed to bed. The next morning, still feeling unnerved and sad about the situation, and in half wakefulness, this vision came. It did not make any meaning to me, so I totally forgot about it. I did not get up till 10, and wanted to meet Elaine, and Amy for coffee but I ended up getting distracted by morning garden duties. By the time I was done, it was almost 11.30am. In the end, I decided to head to Macca's to get some take away lunch, and meet them both in Elaine's home. At Elaine's, we chatted a bit. Halfway through the mid-day, I was distracted by the books on Elaine's bookcase. 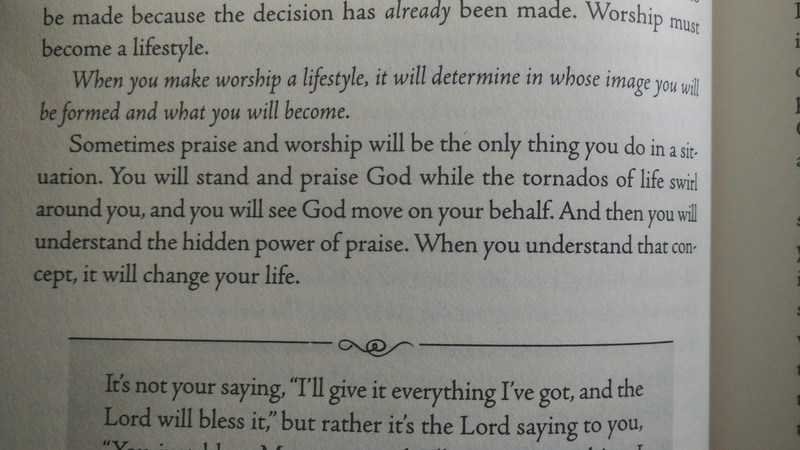 I saw a book by Stormie Omartian, called "The Prayer that Changes Everything: The Hidden Power of Praising God". I had found Stormie's blogsite the day before, and her experiences seemed solid, so I thought it was worth checking out. Elaine allowed me borrow her book, and when I got home, I decided to just skim through the book for a while. I thought it would be another book until I found this paragraph in Page 22. 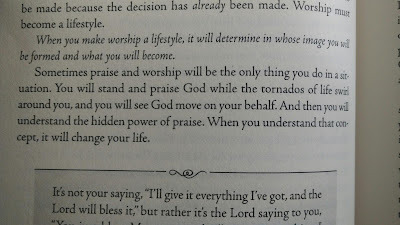 "You will stand and praise God while the TORNADOS of life swirl around you, and you will see God move on your behalf. And then you will understand the hidden power of praise. When you understand that concept, it will change your life". It was much too coincidental to be seeing the same word twice in the span of 7 hours. It was too much of a coincidence to see the same word three times in a row, each time in a different form. (in my mind, in the book, and the author's name is also Stormie). Having read the passage above, I felt that the Lord had finally answered all my queries. I felt like Joshua leading the army of Israel into the land of Canaan to conquer the wall of Jericho. Soldiers do not query their commander once the command has been given. As a soldier of Christ, this is the Chief's final command to me, to complete this task which has been assigned to me. As of yesterday, I no longer had any visions, as it was no longer necessary for now. My job is to bring this task to completion. It is time to bring the wall of Jericho down!